The assassination of Abraham Lincoln is a central drama of the American experience. Its impact is felt to this day, and the basic story is known to all. 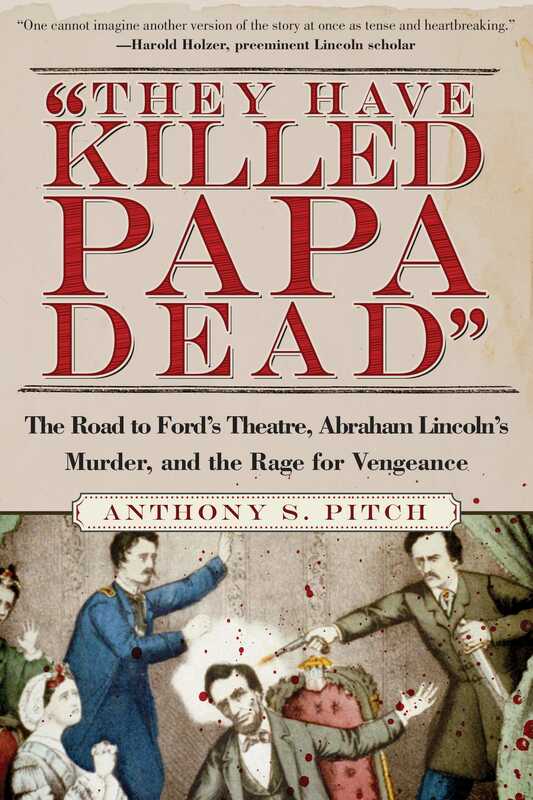 Anthony Pitch's thrilling account of the Lincoln conspiracy and its aftermath transcends the mere facts of that awful night during which dashing actor John Wilkes Booth shot Lincoln in the head and would-be assassin Lewis Payne butchered Secretary of State William Seward in the bed of his own home. "They Have Killed Papa Dead!" transports the reader to one of the most breathtaking moments in history, and reveals much about the stories, passions, and times of those who shaped this great tragedy. Virtually every word of Anthony Pitch's account is based on primary source material: quotes from previously unpublished documents, diaries, letters, and journals. With an unwavering fidelity to historical accuracy, Pitch provides confirmation of threats against the president-elect's life as he traveled to Washington by train for his first inauguration, and a vivid personal account of John Wilkes Booth being physically restrained from approaching Lincoln at his second inauguration. Perhaps most chillingly, details come to light about conditions in the special prison where the civilian conspirators accused of participating in the Lincoln assassination endured tortuous conditions in extreme isolation and deprivation, hooded and shackled, before and even during their military trial. Pitch masterfully synthesizes the findings of his prodigious research into a tight, gripping narrative that adds important insights to our national story. ?One cannot imagine another version of the story at once as tense and heartbreaking.? ?If not the definitive story of the assassination and the events before and after, then the one that readers should turn to first.? ?So well written and researched that it will add greatly to our knowledge of Lincolniana.? ?A study of burning focus and intimate depth.? ?No reader will come away unmoved, even at this distance, by anguish about [Lincoln's assassination]. . . . a real page-turner about real history.? ?If you're ever in Washington D.C., take a moment to go on a Lincoln assassination walking tour with historian Anthony Pitch. It's not grim, and you'll learn plenty by understanding just how tiny the capital was ? and how near the major players were to each other ? on the day Lincoln was shot. The next best thing to being there is reading Pitch's They Have Killed Papa Dead! : The Road to Ford's Theatre, Abraham Lincoln's Murder, and the Rage for Vengeance. He writes about the desperate efforts to protect the president, who was always in danger, plus the devastating grief and cruel injustice that came after Lincoln?s death.? ?Anthony S. Pitch's "They Have Killed Papa Dead!" is a special book that will surely serve as a benchmark in the vast Lincoln-related lore. . . . Pitch's book is riveting because of exquisitely detailed research, a fast-paced narrative that is evocative in depicting the personalities and places central to understanding Booth's original plan to kidnap the president. . . The reader is kept so close to the details of the events described as to feel more like a close observer than an armchair reader 145 years later. . . . Pitch's masterful and highly readable account is a significant addition to the vast Lincoln record and a fascinating introduction for the lay reader to the complexities of this searing chapter in American history.? ?This is an intense, vivid and moving portrayal of a family (and a country) brutally deprived of its leader.? ?This is history as it should be written ? compelling, gritty and up close & personal.? ?Papa delves into the fevered world of John Wilkes Booth. Possessing the looks of a matinee idol, Lincoln's assassin exerted a Charles Manson-like grip on his co-conspirators. Papa races along through the manhunt, the trials, the executions. A treat for the Lincoln fanatic.? ?A meticulously researched narrative of the Lincoln assassination, from the conspiracy and murder through the ensuing manhunt and trial. . . . Pitch turns the tragedy into a great American true-crime story.? ?Pitch's energetic narrative will be highly popular.? ?What, another book on the assassination of Abraham Lincoln? What more can be said about the regicide of our greatest President? Actually, Anthony Pitch's beautifully written narrative stands on its own as a splendid contribution to the subject. It is told by an author who has an intimate knowledge of all the sites related to the assassination and the trials that followed.? Book Cover Image (jpg): They Have Killed Papa Dead!